Our oldest is in second grade. 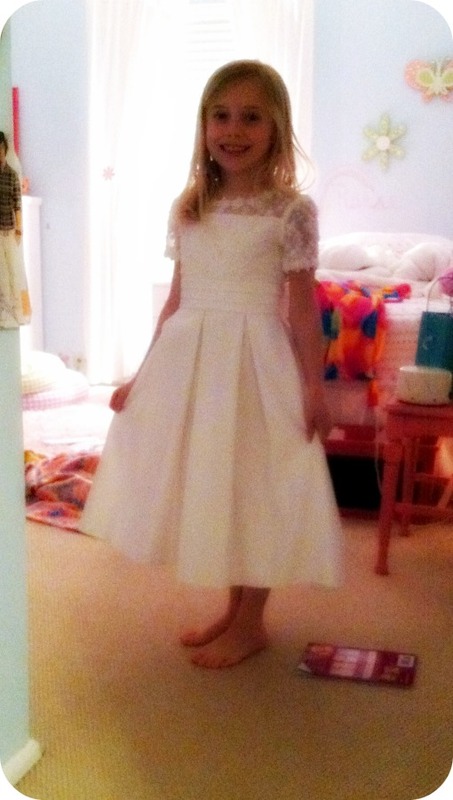 She is a few weeks away from receiving her First Communion, and she’s very excited about it. She tried her dress on the other night and the look on her face when she saw her reflection in the mirror…I’ve seen Christmas trees that weren’t lit up as much as that kid. She beamed and immediately asked if I could take a picture of her and email it to her teacher so she could see it. My initial thought was no, your teacher’s busy, she doesn’t need an email from me telling her to look at a picture. I don’t want to be THAT mom. Then I thought, ah, why not? I know it must mean a lot to Reese if she asked immediately if she could show her teacher. Her words hit me like a ton of bricks. Thanks for listening to her. Something I almost didn’t, and a lot of times I don’t. …No, we can’t do that now, we’ve got to GO! …Hurry up, tell me later. …Get your shoes on, show me when we get back. Because sometimes I’m just too tired. …It’s past your bedtime, you can tell me about it tomorrow. …Please, brush your teeth and for the love of God, just get. to. BED! Or I’m checking my email or phone and half listen while my kids tell me an important part of their day. Even if it’s telling me what they ate for lunch – it’s important enough for them to want to tell me, so it’s important enough that I LISTEN. To be perfectly honest, I think I DON’T listen too much of the time. That’s going to change, because this teacher gave me a wake-up call without even realizing it. Kids just want to be listened to, really. That’s all. To be heard, to think what they have to say matters. It made me think back to my first grade teacher, who probably played the biggest part in my decision to become a teacher. She was incredible. I always went by Elizabeth in school, and one day I thought it would be fun to start going by “Beth.” So I told her when I came in that morning, that I had a new name. But when I think about the impact it had on me that day, and 30 years later…she listened to me. What I said and felt mattered. Sure, she taught me how to read and write, and add numbers. But I don’t remember that. I remember how I felt every day when I walked in her classroom. For reminding me how important it is to listen to my child, Mrs. F. and Mrs. D., and every amazing teacher out there who listens, I thank you from the very bottom of my heart. You’re not only impacting your students, but their parents too. That day I sent the email, she skipped home off the bus and couldn’t wait to tell me how much Mrs. F. loved her dress. And I loved that she knew Mommy was listening. Please stop having perfect children so that the rest of us can feel like we have a chance at having good ones. The odds go only so far in each of our favor and you’re really tilting the scales, here. You always crack me up, Philbert! ;) Your kids will be perfect…and hilarious. Thank you Vicki! I miss you!! What a great truth! I’ve been trying to make a point of staying off Facebook and Pinterest and emails when my kids are home because I want to have true face-to-face time. When my kiddos look back on their childhood I don’t want them to remember me as too busy to listen, too busy to care. I want to value every moment of time I have with them. Thank you for this encouragement! What a sweet and pretty girl! What a Precious Lil Princess You are Reese!!! I just loved this story Liz!! Warmed my heart!!! I volunteered for 5 years in the classroom when my youngest started school. It was some of THE MOST rewarding times of my life!!! It was in the late 80’s early 90’s and I still have things, (treasures to me) the kids made/wrote to me!!! Thank you for a great message! I’m a grandma of 10 month old twin grandsons and loving every minute of it! It seems as though it’s a second chance to get it right or another chance to learn from the mistakes we made as a parent, it’s the best! I put my heart and sole into being the best grandma I can and I LOVE this reminder! Thank you for sharing! !